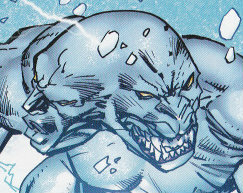 Other Distinguishing Features: Blue skin and two heads with four arms. One head has human male features and the other of a savage beast. Head-Case is seen briefly fighting Malcolm and is quickly defeated after being hit in the nuts.